Whether you move for business or pleasure, keep your laptop and documents safe in the padded MINI Two- Tone Laptop Bag. 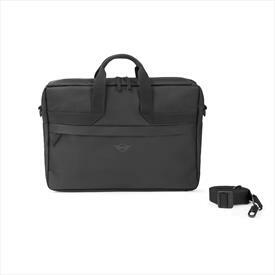 It has multiple compartments, including a padded laptop compartment for extra protection, as well as separate pockets for files and stationary plus a smart, zippered outside pocket that lets you attach the laptop bag to your cabin trolley‘s pull-out handle. The straps can be adjusted to go over the shoulder or cross body, or simply use the handles. A tonal MINI Wing Logo rubber print embellishes the front of the bag.